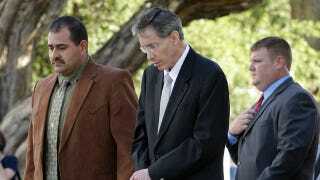 The Warren Jeffs trial came to a close today when the polygamist leader was given a life sentence for sexually assaulting two of his underage "spiritual wives." The Texas jury, which quickly found Jeffs guilty last week, deliberated for less than 30 minutes before giving Jeffs the maximum sentence of 99 years for one charge and 20 years for the other. Once again, defense attorneys pointed out the obvious: That he made a huge mistake by firing them. When Deric Walpole, who's described as Jeffs' "on-again-off-again" lawyer, was asked what he would have done differently, he replied, "Lots." Defense attorneys said that there were grounds for an appeal since evidence was seized during a 2008 raid triggered by a phone call that turned out to be a hoax. However, they won't be representing Jeffs if he decides to appeal. Though Jeffs made rambling objections about religious freedom during the trial, the Washington Post reports that he refused to participate in the sentencing phase and remained in his cell during the proceedings. (Weirdly, his sentencing was attended by a "retired couple who also sat in on the Casey Anthony trial in Florida.") Today in court he was silent as the verdict was read, and was flown to a prison across the state several hours later. Jeffs must serve 35 years of the life sentence and 10 years of the second sentence, so he won't be eligible for parole until he's at least 100. During his closing today, prosecutor Eric Nichols referenced a line Jeffs wrote in his journal in 2005: "If the world knew what I was doing, they would hang me from the highest tree." Nichols responded, "No, Mr. Jeffs, unlike what you wrote in your priesthood records ... we don't hang convicts anymore from the highest tree. Not even child molesters." But we do lock them up for a very, very long time.